This weekend the stage of Mandel Hall was transformed into 15th century Spain for University Ballet’s performance of Don Quixote. The performance was a variation on the original three-act ballet piece, which was accompanied by the music of Ludwig Minkus. The changes between the original performance and University Ballet’s take on Don Quixote were the result of the company’s smaller size relative to a professional one, as first-year Adia Sykes explained. There were around 80 people in the production, and although there were three acts, the curtain opened four times. Although the ballet is called Don Quixote and is based on the classic novel by Miguel de Cervantes, Don Quixote was not the central character in this piece. The plot of the ballet focuses around the love story of Kitri, a beautiful girl who’s well-liked in her village, and Basilio, a poor, young musician. Kitri and Basilio (fourth-year graduate student Jessica Lin and fourth-year Erik Landry) stole the show with the complexity of their dances and the quality of their movement. What makes Don Quixote such an original piece to perform is that it’s focused on storytelling and pantomime, rather than classically styled ballet movements. 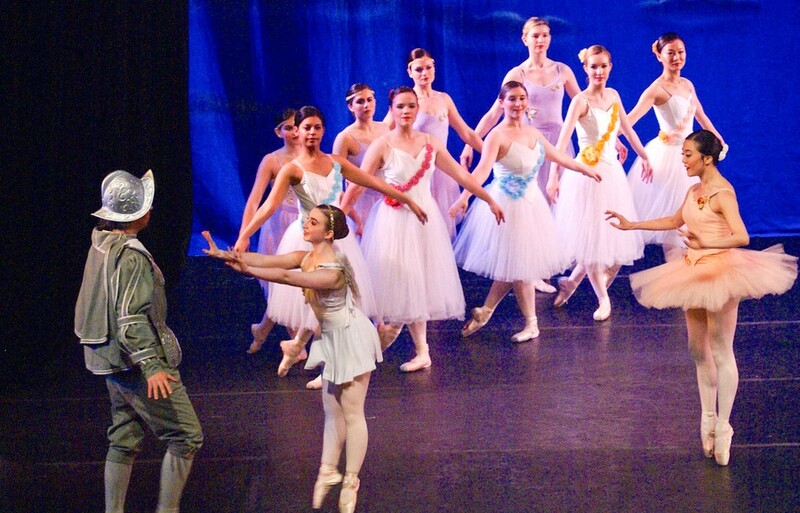 To emphasize this unusual aspect of UBallet’s performance, the show opened with several members of the company explaining the definition of ballet through pantomime; they thereby gave the audience a smooth transition into their unique mode of storytelling. The first act of the performance centered around Kitri’s and Basilio’s love story. Their happy ending meets an obstacle in Kitri’s father, who places a ban on their marriage, since he prefers she marry a wealthier gentleman, although through dance he is portrayed as having a weaker character than Basilio. The first act also introduces Don Quixote and Sancho Panza (second-year Jay Cushing and sociology postdoctoral student Jacob Foster). Following multiple dances, including one in which Kitri uses castanets, the curtain closes for the first time as Kitri and Basilio escape from the village in an act of defiance to Kitri’s father. The second act was arguably the most vivid and exciting of this UBallet performance, as it told the story of the couple’s encounter with gypsies. This incident is performed as a ballet, but the dancers wear outfits of traditional bellydancers, which make noise as the ballerinas dance. The second part of this act was a scene in which, after his encounter with a windmill, Don Quixote dreams about the Queen of the Dryads and several ballerinas dressed in white. The final act is set in the village tavern after Kitri and Basilio have returned to the village. As Lorenzo, Kitri’s father, notices her trying to get out of the tavern, he tries once more to force her into marriage with the wealthy gentleman. At this point, Basilio, flustered, comes in, pretending he feels betrayed, and stages a death scene. Throughout this scene, the audience could not restrain its laughter, which was further amplified when Basilio jumped up healthy and happy after Lorenzo, failing to see the act of Basilio’s pretend death, agreed to Kitri’s and Basilio’s marriage. The extent to which the dancers who played Don Quixote, Sancho Panza, and Lorenzo actually used ballet was very limited, in keeping with the production’s commitment to pantomime. These characters pantomimed most of their actions, and this made the performance entertaining and very easy to understand to audience members who might not have been familiar with ballet. The costumes were also memorable; the contrast between the classical tutus the bridesmaids wore and the funny, 15th century Spanish knight costume of Don Quixote added to this show’s professionalism. The backdrop changed four times during the three acts to accompany the scenes. The professionalism and the entertaining nature of the performance made UBallet’s Don Quixote a fantastic spring show.